Last week I went to see my midwife for my 34-week appointment, and while I was there I got to have an ultrasound to see the baby. During the ultrasound I got some news I really didn’t want to hear…Peanut #2 is breech. I was really hoping this wouldn’t happen again because I want to do whatever I can to avoid having to have another c-section. The good news is that we have a lot more time than we did when I was pregnant with Elyse. Please keep your fingers crossed for us over the next few weeks…I really do not want to undergo another c-section and all the hospital time and recovery that is involved with it. I can’t imagine staying in the hospital so long while Elyse is at home, and I know I’ll be anxious to bring the new baby home to start our new life together. 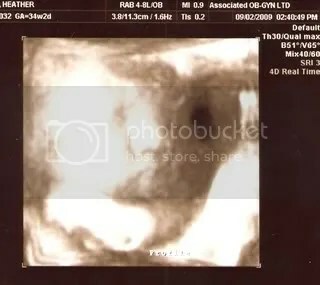 The good thing that came from the ultrasound was this 3D picture of his/her cute little face…look at those chubby cheeks!